Step-6. Select the front_fender mesh and get into edit mode. 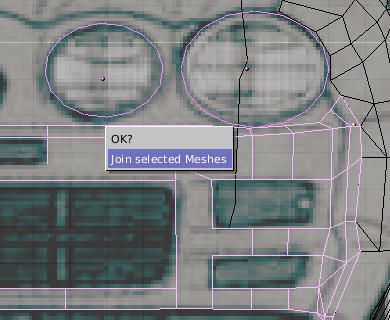 Select the front vertices of the mesh duplicate it ‘Shift+d’ pressing ‘Enter’ to confirm then separate it ‘P’ and ‘Enter’ to confirm see Image9a. Select the separated bumper mesh and get into the top viewport and start extruding it following the background blueprint till half part of the car is reached. Click Image9b for bigger image. 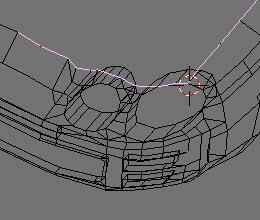 Here keep in check the number of extrusions just enough to get the shape right or you can follow from the image. If you were able to adjust the background image size properly with the mesh size you will get right proportion here is what Ton Roosendaal’s once said “Blender is for artist’s” in other words use your intuition and observation. Before proceeding fine tune the meshes now till you are satisfied. Image9a. separation and duplication for the bumper mesh. 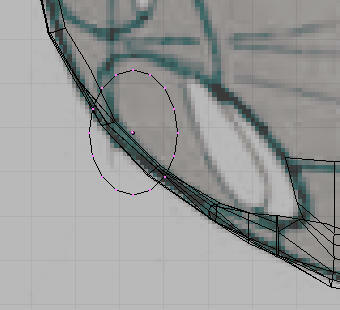 As you will observe I derived the bumper mesh from the portion of tire cover mesh. I did it so that the whole model has symmetry in the mesh (read number of lines or edges) which is both easier to work with. And in car modeling since every part is modeled to fit another seamlessly you will see quite a lot use of this method. This provides consistent mesh structure throughout and is a step for a clean mesh. Step-7. In front view port place cursor in the middle of one of the headlamps and add a circle (16 vertices) and size it by tracing the headlamp in the background image. First rotate it inside viewport to match the angle then go to top viewport Image10a and rotate it and adjust it to match the titled angle of the lamp, check in other viewports too. Adjust.. tweak.. till you get you mesh as in Image10b. Image10a. Lamp mesh in top view after rotation inside viewport. Image10b. Lamp mesh at the correct position. Now Get out of the edit mode go to front viewport again and duplicate the lamp mesh for the other headlamp and scale down as required. Now select the three meshes lamp1, lamp2, and the front bumper one after one by keeping ‘Shift key’ pressed and right clicking each mesh. After these three and only these three meshes are selected press Ctrl+J to join meshes into a single mesh as in Image11. Image11. joining of the three meshes to form front bumper. Step-8. Select the front bumper mesh get into the edit mode and start joining the faces and adding more faces to the front bumper mesh as and when required to complete it as in Image12. Image12. Wireframe view of the front bumper mesh. Step-9. 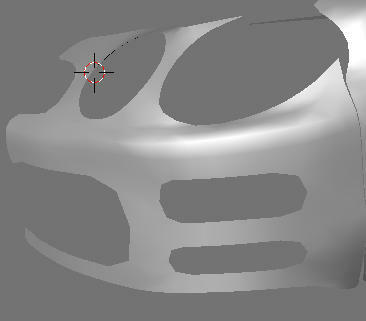 The Image13 shows the front bumper after faces had been added and joined to make the single mesh. Image13. front bumper meshes in shade mode after addition of faces.